Duffy, best known for being a Dragon’s Den panelist, confirmed the news on Twitter this morning. BUSINESSMAN GAVIN DUFFY has formally announced that he is seeking a nomination to contest the presidential election. Good morning. Just to let you know after some speculation I confirm that I am seeking a nomination from four local authorities to contest the Presidential Election. I have accepted an Invitation to speak to @WaterfordCounci this Tuesday at 4pm. Duffy added that if he gets the required four council nominations he will run the “most modern, dynamic, interactive election campaign possible”. 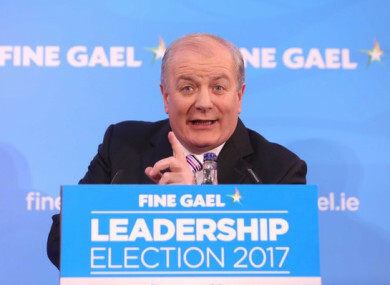 Earlier this month, rival Dragon Den panelist Sean Gallagher wrote to all of the councils in Ireland asking that they formally set aside time to discuss nominations for the president of Ireland. Gallagher has not said, however, whether he wishes to contest the election himself. He was the surprise front-runner for much of the 2011 campaign but lost out to Higgins. This election is viewed by many as a one-horse race since Michael D Higgins announced his intention to seek a second term in office. Earlier this week Independent Senator Gerard Craughwell announced he will not be contesting the presidential election because he can’t afford it. Fianna Fáil and Fine Gael have chosen not to run a candidate of their own against Michael D Higgins, but Sinn Féin has said it would put someone forward for election. The party says it will announce its presidential candidate in September. Duffy is now the third candidate to seek a nomination, along with Higgins and Independent Senator Joan Freeman. Freeman, the founder of mental health charity Pieta House, has asked for the opportunity to present to councils for their nomination so that she can assemble “a comprehensive campaign in order to compete in the upcoming presidential election”. Email “Gavin Duffy seeking nomination for presidential election ”. Feedback on “Gavin Duffy seeking nomination for presidential election ”.